Bindings are made easy in this class! 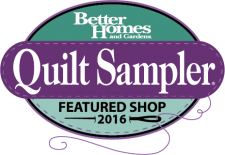 You'll receive a kit that includes binding strips and two mini quilts on which to work so you don't have to worry about messing up one of your own projects. We'll go through all the steps of binding, from figuring out the yardage requirement, all the way to the hand stitching. You'll be a binding pro in no time! Two sessions to choose from, either morning or evening. It's summer and we all want beautiful curves! we can help you create beautiful curves in your next quilt. 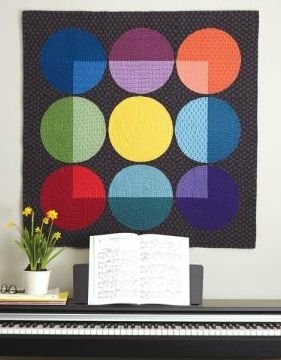 Making this striking wall hanging will give you all the practice you need in learning the step by step process of piecing beautiful curves. Don't be afraid, it really is easy and quite forgiving, unlike our bathing suits. Two-day Class ~ Space is limited so sign up today. Here is a list of some fun upcoming classes coming to M&E. As soon as we get them on the calendar we will let you know. Starts Next Week ~ Tuesday, July 1st! so that we may spend the holiday with our families. We will be open again on Saturday for normal hours.